transmission line reflection coefficient (ρ) calculator - step by step calculation, formula & solved example problem to find how much of an electrical wave reflected by an impedance discontinuity in the transmission line or medium. 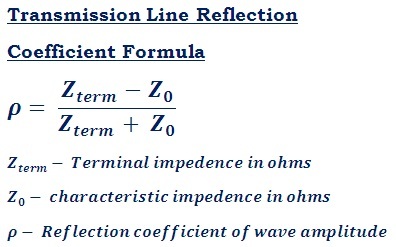 Terminal impedance Zterm & characteristic impedance Z0 are the key terms of this calculation. Reflection coefficient is also known as relectance of the system, is the ratio of reflected wave amplitude to the incident wave amplitude. The below step by step solved example problem may helpful for users to understand how the input values are being used in such calculations to find how much of an electrical wave reflected by an impedance discontinuity in the transmission line or medium. Find the reflection coefficient (ρ) of the lossless transmission line whose terminal impedance Zterm = 9 kilo ohms & characteristic impedance Z0 = 7 kilo ohms. In the field of electrical engineering, it's important to calculate the reflection coefficient (ρ) to analyse the transmission lines. The above formula, step by step calculation & solved example problem may be useful for users to understand how the values are being used in the formula to find the ratio of reflected wave amplitude to the incident wave amplitude of the lossless transmission line, however, when it comes to online for quick calculations, this calculator helps the user to perform & verify such calculations as quick as possible.